Having been given very precise directions by Kay as to where she saw and photographed Scarlet-chested Parrots, it was a no-brainer that one of the first ports of call on my 6,000 kilometre inland adventure should be Gluepot to see if I could see this amazing bird myself. It eluded us the first afternoon but next morning we spread the net a bit wider and after a couple of hours were rewarded with brilliant views as a small group of the young male parrots started feeding near where we then were. 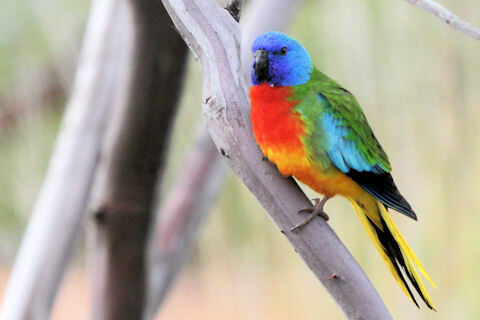 This is one of Australia's most beautiful parrots so many thanks Kay.